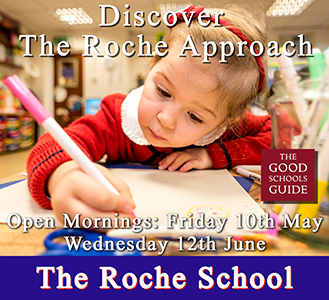 I visited the Roche last year on an Open morning and was really impressed with the atmosphere and the staff that I spoke to. They also have a great write up in the The Good Schools Guide too. I have two children at The Roche - one now in year 4 and the other in year 1. The youngest went to the nursery at the main school site for a year before reception and we couldn't have been happier. The curriculum is varied and stimulating and he loved it so much we had to drag him away from nursery every day! The nursery and the school provides a unique, warm and caring environment, where your child will be encouraged and supported in their development at every stage. The early years teachers in nursery and reception are fantastic and I found that my youngest was much better prepared for transition to reception in the main school, than my daughter, who did not go there. Further up the school, I have been very impressed with the individual attention and approach to each child's progress and development and the careful monitoring of each child, with many going on to top schools. The school is non selective and art, music, drama and sport are very strong, alongside the academic subjects, as well as plenty of extra curricular clubs and activities - it really does cater for all. I would go with your instinct and how you felt about it - if it felt like the right place for your child and for your family, you will most probably be right! We certainly haven't regretted our choice for a second. My daughter went to the Roche Nursery on Keswick Road, and we were so impressed that we turned down her place at a supposedly more sought-after local prep so she could continue to the main school. Keswick Road was absolutely excellent - neither my husband nor I nor our daughter could have been happier with it. Great, kind, attentive, caring teachers, tiny groups - it really has a very nurturing, almost family atmosphere. I can't recommend it highly enough. Agreed. We loved the keswick nursery and turned down a place at a sought after battersea kindy to go there. Lots of exits to Putney high, wimbledon high, ken prep and thomas’s our year if you’re looking for that sort of thing.